One of the references is this and this which mention that it was possible but I'm not sure just how. If we overlook the two main problems - the risk of infection and the blood incompatibility - then it is possible and not even too difficult. A long, thin copper or gold tube was well within the possibilities of Roman jewellers. They made those for jewelry, but make them they did. The tube will not be very flexible, but it doesn't need to be - too much. Needles also are doable, again in either copper or gold. They're malleable and resistant enough to pierce the flesh, even if they will need frequent sharpening and replacement. Place the donor about a foot lower than the recipient, puncture the median cubital vein of donor, wait until a drop of blood appears at the other needle. This because the first recipients (and possibly donors) will die from embolisms, but since blood is a liquid and the relevant principles of hydraulics were known to the Greek, how to avoid getting too much air in people's blood vessels will be discovered without the need for too many convicted criminals to go to their deaths (not that way, at least). Prick the recipient again in the median cubital vein, then raise the donor. Donor's blood pressure will drive the blood inside the tube, and hydraulic pressure will drive it inside the recipient. Knowing when it's enough will probably be the major hurdle left. Some Josephus Mengelis in the thirteenth century will probably experiment by bloodletting a serf until the appearance of the telltale pallor, then letting him recover and timing how many days it took on average (the Romans already knew about averages, and possibly they might have understood the concept of statistical significance). The next step would have been to compare the recovery time after receiving a blood transfusion. 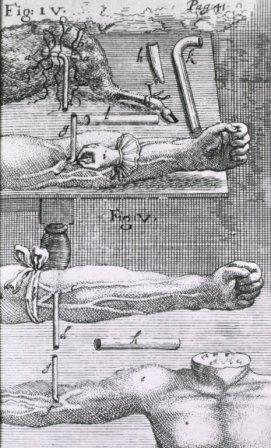 The above technique (but with silver tubes, which might have helped with sterilisation) was approximately described in 1613, then better expounded in his Appendix of 1615, by Andrew Libavius, but the main concept of "blood to blood" (instead of e.g. drinking or bathing in blood) had been already explored by Paracelsus, and briefly touched even earlier by someone that I suspect had attempted it without success, almost certainly due to blood incompatibility. (Actually the idea appeared much earlier; Medea in Greek mythology did reportedly perform an auto-transfusion for Jason's father Aeson, and was asked to do it again for King Pelias). So, if we remove the major obstacles and handwave in the working analogous of a germ theory (the equipment will need to be sterilized by boiling, or a transfusion will be nothing but a death sentence), there's no reason why it could not work. Other commenters mentioned needles and sterilization, but obviously the key question is how to determine blood type compatibility. Attempts at blood transfusion were done centuries ago, but without coping with compatibility problem it was like playing Russian roulette with several bullets in the cylinder. I am not a doctor so any of the following should be taken with a grain of salt. There is nice summary for it here though authors assume that we have centrifuge and microscope. For most basic test you need to mix the patient’s serum and donor blood, and allow it to set at room temperature for five minutes. Then you look for clogging. As I understand you need microscope to see clots. Maybe a good magnifying glass would be enough. The simplest microscope is not that hard to make but they appeared only in the beginning of 16th century. You can get serum simply by putting blood in cold place and waiting for about 10 hours. Even very primitive centrifuge could make it much faster, in this case you would not need cold place. There are many things that this simplest test would miss - allergy, Febrile Nonhemolytic reaction, etc. Usually transfusion is started slowly and for the first 15 minutes the receiving patient is watched closely. Obviously, DO NOT TRY IT AT HOME. If it's typical Middle Ages perhaps not. Since in our middle ages we lost much technology. However in roman times yes. Glass tubes could be used for the injection sight. You could in fact use a specially made glass tube for the whole process. This would be the most sterile technology available at the time (if they did not reuse the them). But potentially some sort of hide tube might be used to aid it. You could do it even prior to ancient Rome if you wanted. Since the 1650’s experimentation used hollow goose quills and pigs bladders. Not the answer you're looking for? Browse other questions tagged blood middle-ages or ask your own question.